Towering flames erupted from the base of the Delta IV Heavy at 17:51 UTC followed moments later by the thundering blastoff of the 70-meter tall rocket lifted by three powerful engines. 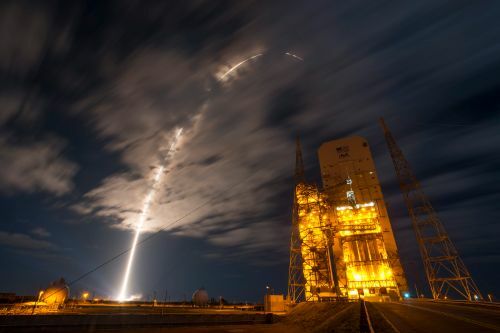 The 737-metric-ton Delta IV completed a brief vertical climb to swing to a south-easterly flight path, embarking on a multi-hour mission aiming for a direct injection into Geostationary Orbit. Delta’s early flight events were by the book before the mission headed into a pre-arranged news blackout that is customary for NRO missions to allow the agency’s satellites to head into their classified orbital trajectories without the public watching. Following the confirmation of payload fairing separation, no more updates on mission progress are available with the exception of a confirmation of launch success, provided a little over five and a half hours after launch. Riding into space hidden under Delta’s payload fairing was the world’s largest satellite, belonging to the U.S. Signals Intelligence program. NROL-37 was identified as the seventh Advanced Orion Signals Intelligence satellite through the analysis of the launch vehicle configuration in use, the launch site and time, as well as the current framework of NRO missions. The National Reconnaissance Office, responsible for the development and operation of America’s spy satellites, goes through great lengths of keeping its activities secret, however, occasional leaks and satellite trackers analyzing movements in orbit often uncover the identity of satellites. Advanced Orion satellites, also known under their codename Mentor, are large geostationary spacecraft outfitted with huge deployable mesh antennas that approach 100 meters in diameter. Their task is to intercept missile telemetry over foreign territories as well as other forms of electronic communications on the ground and in space. The first Geostationary Signals Intelligence satellites launched by the U.S. were three Aquacade spacecraft in the 1970s, only weighing in at 700 Kilograms and featuring dishes around 20 meters in diameter. The first two Orion satellites, also known as Magnum, launched aboard Space Shuttle Discovery in 1985 and ’89, reportedly featuring 50-meter antennas and weighing approximately 5,200 Kilograms. Both Aquacade and Orion were operated by the U.S. Air Force. The heavier Advanced Orion satellites debuted in 1995 with the launch of Orion 3, USA 110. The first three Advanced Orion birds were launched by the Titan IV rocket before its retirement. Delta IV Heavy launched its first Advanced Orion Satellite in 2009 on the NROL-26 mission followed by NROL-32 the next year. 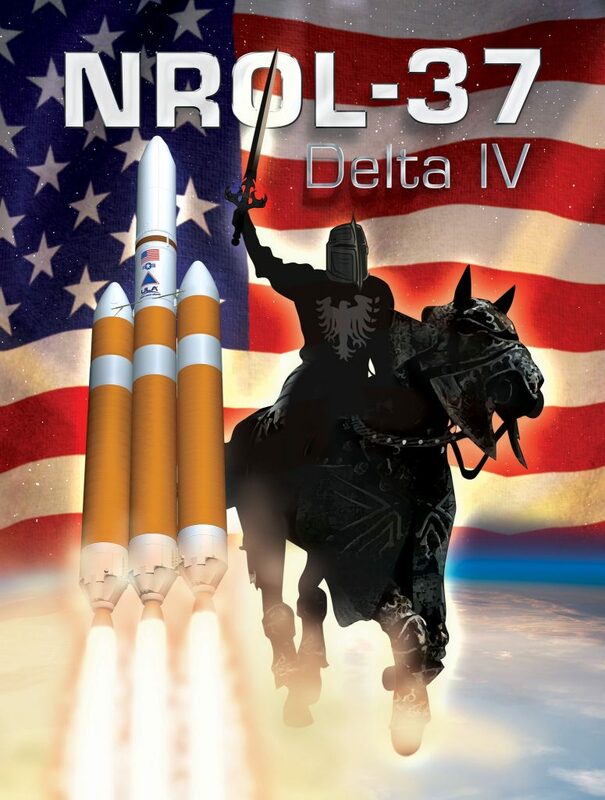 NROL-15, launched in 2012, was of particular interest as it was the first flight of the Delta IV with the improved RS-68A engine that was developed in part for this particular mission – indicating that this mission’s payload mass and target orbit were outside of the vehicle’s previous capabilities. 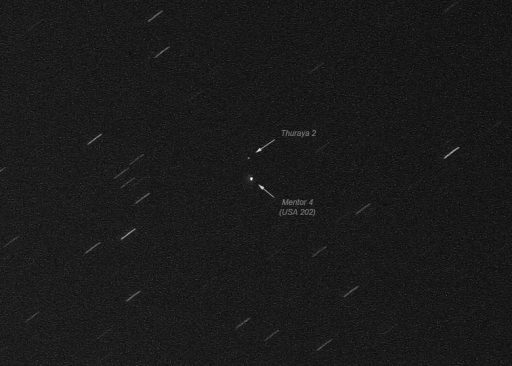 This suggested that the Advanced Orion satellites had once again gained mass, likely in an upgrade to a modified version – requiring Delta’s direct GEO insertion capability to be improved from 6,275 to 6,750 Kilograms. With its heavy payload securely tucked away inside the large metal fairing, Delta IV Heavy headed into a long countdown at sunrise, starting with the retraction of the large Mobile Service Tower at Space Launch Complex 37B to reveal the rocket atop its launch pad. Delta IV Heavy is comprised of three Common Booster Cores strapped together with a Delta Cryogenic Second Stage on top of the central core, creating what currently is America’s most powerful rocket. 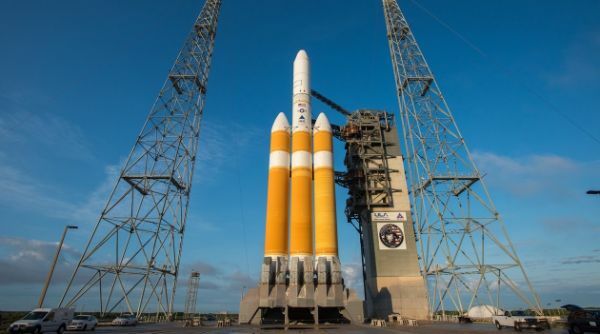 Eventually, Delta IV will lose that rank when SpaceX premieres its Falcon Heavy rocket. 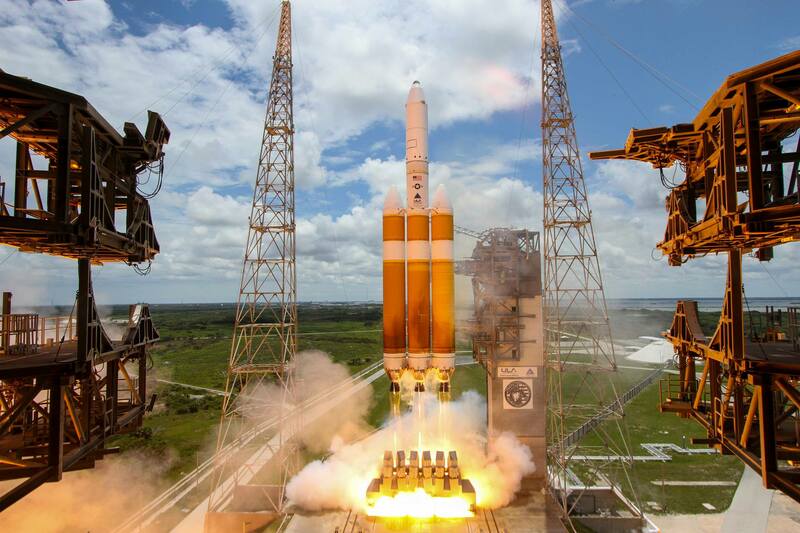 Out of 32 Delta IV missions, the Heavy configuration has flown nine times with payloads for the U.S. Air Force, the NRO and NASA. In its previous mission, DIV Heavy lofted NASA’s Orion spacecraft in a shakedown mission taking the capsule twice around the planet to qualify it for crewed missions. 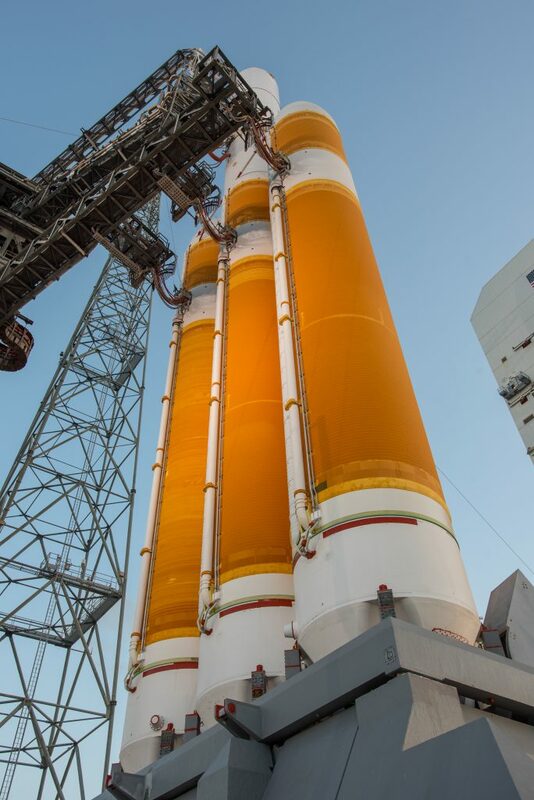 Standing over 70 meters tall, the Delta IV Heavy has a launch mass of 733 metric tons with its three boosters creating a span of 15 meters from side to side. All of its stages use cryogenic propellants, Liquid Hydrogen and Liquid Oxygen, maximizing the rocket’s efficiency from a propulsion standpoint. After Delta’s RIFCA – Redundant Inertial Flight Control Assembly – was activated, the launcher headed into a detailed series of checkouts while the Launch Team also put tanking procedures into motion. Over the course of a three-hour sequence, 633 metric tons of supercold propellants were pumped into the three booster cores and the DCSS upper stage. After a brief chilldown of their tanks, each of the boosters received 202,000 Kilograms of -183°C LOX and -253°C LH2 with propellant loading commencing four hours prior to liftoff. The second stage headed into propellant loading inside three hours to launch, being filled with 27,200 Kilograms of cryogenics. 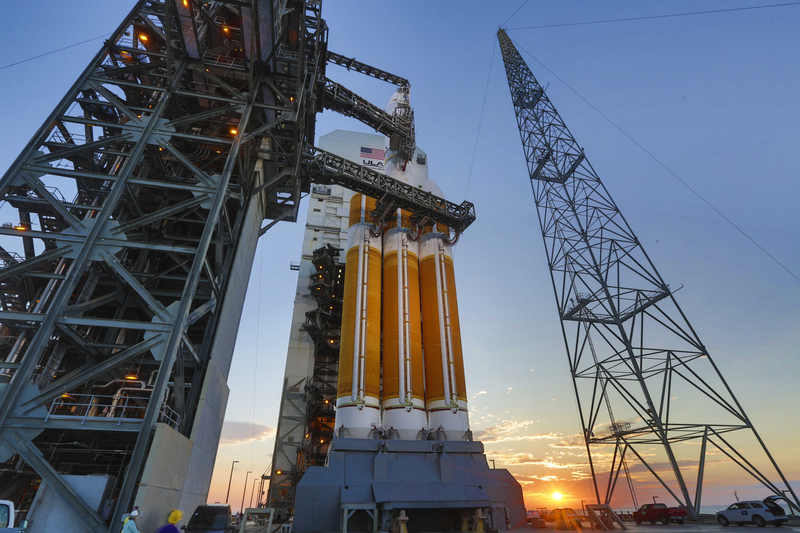 When fueling was complete, Delta IV entered another series of testing operations while propellants were continuously replenished with final conditioning of all tanks occurring in the final hour of the count. 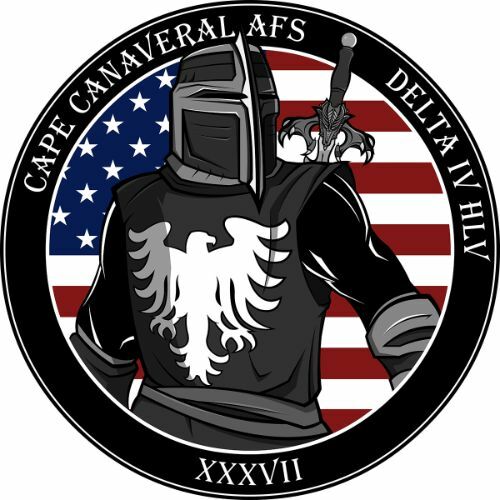 The classified NROL-37 satellite switched to battery power and a GO was given by all support stations, clearing Delta IV to head into its Automated Countdown Sequence. Over the last four minutes of the count, Delta IV secured and pressurized its tanks, switched to battery power and assumed control of the countdown. Sparklers began to fire to safely burn residual Hydrogen which is released abundantly during the fuel-rich ignition sequence of the three RS-68A engines that commenced at T-8 seconds. The three engines were ignited in a staggered fashion – a measure implemented in recent years to reduce the size of the hydrogen-fueled fireball rising along the rocket’s boosters during the ignition sequence, thus reducing fire damage to the booster’s insulation. Soaring up to a collective liftoff thrust of 960 metric ton force, the three engines were monitored by computers before Delta IV was committed to launch and released from the ground to begin rising. 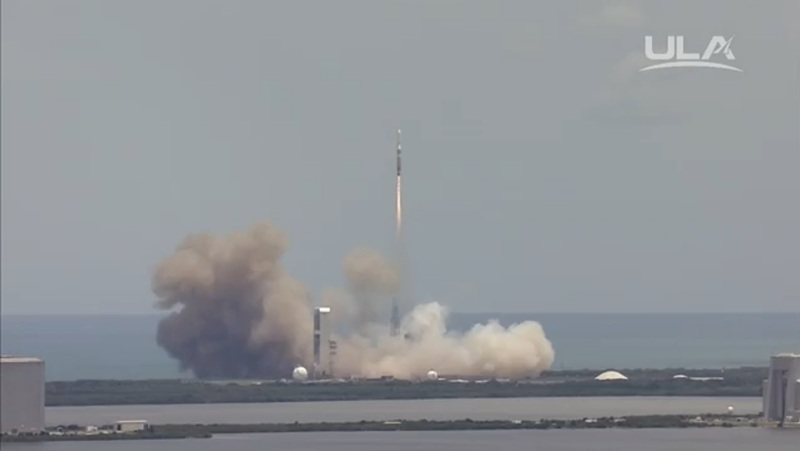 Liftoff occurred at the opening second of the day’s launch window at 17:51:00 UTC. 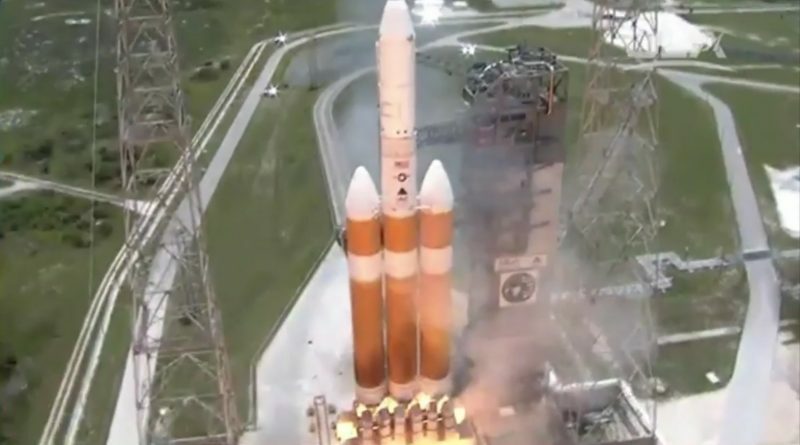 Appearing to climb in slow motion, Delta IV Heavy gracefully ascended from its launch pad, gimbaling the RS-68A engines to maintain an upright posture. The vehicle started to roll and pitch to attain a south-easterly heading to take the standard path to Geostationary Orbit. Just prior to hitting the T+1 minute mark, the center engine was throttled down to its minimal thrust setting of 56.5% to save propellants in order to be able to fire longer than the strap-on cores which continued operating their engines at 102%. 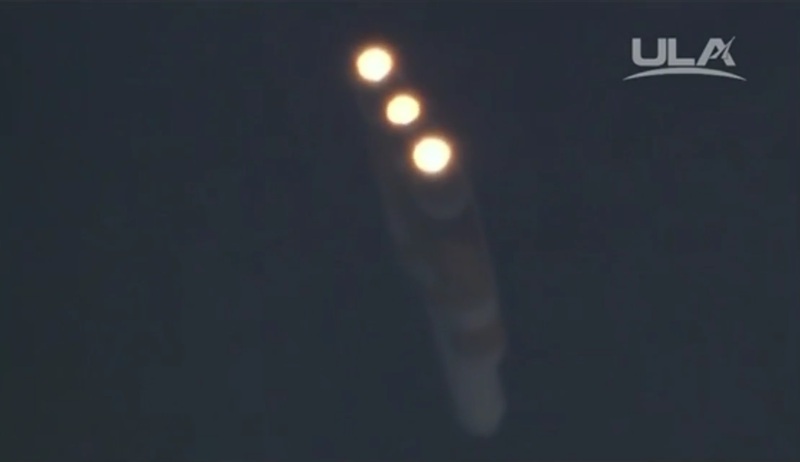 Delta IV headed through Mach 1 and passed Maximum Dynamic Pressure 81 seconds after liftoff. A roll maneuver 2.5 minutes into the flight placed Delta IV into a ‘wings-level’ position for the continued boost out of the discernible atmosphere. The strap-on cores entered their throttle segment three minutes and 47 seconds into flight to set up for the shutdown of their engines at T+3:58. 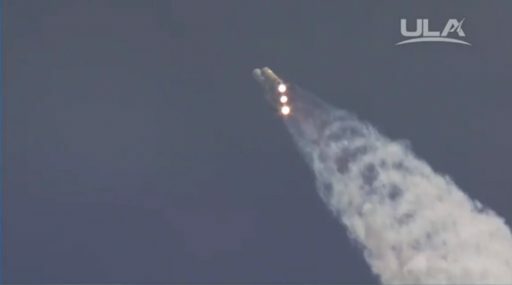 Two seconds later, both boosters cleanly departed the vehicle using separation motors and the core stage reved up to 102% of rated performance to continue pushing the vehicle into space at full throttle. The Central Core continued showing excellent performance as it headed back into throttle mode to maintain an acceleration of 5Gs as the vehicle got lighter and lighter. Shutdown occurred five minutes and 36 seconds after liftoff followed seven seconds later by the firing of pyrotechnic detonators to separate the spent core stage. Once the engine bell of the second stage was clear of the interstage, electromechanical actuators began driving to deploy the RL-10B nozzle extension. Ignition occurred T+5:56 and RL-10B reached its full thrust of 11,200 Kilogram-force. Six and a half minutes after lifting off, Delta IV was flying sufficiently high for the separation of the payload fairing to expose the NROL-37 satellite and shed no-longer needed weight. 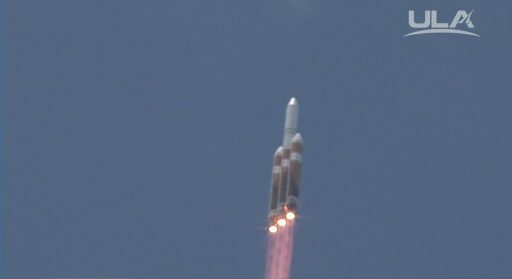 The tri-sector metal fairing separated cleanly and Delta IV headed into its pre-arranged news blackout to continue heading into orbit without the public watching. Per the standard GEO flight profile, the Delta Cryogenic Second Stage was expected to first lift the stack into a Low Earth Parking Orbit and then continue its south-easterly trek so that the second burn could center the equator. Re-igniting the RL-10B engine past T+20 minutes, the vehicle will raise the high point of its orbit to 35,800 Kilometers with apogee positioned above the equator. Next was a multi-hour coast phase to allow the stack to climb all the way up to the apogee of the orbit for the circularization maneuver. This last burn of the RL-10 engine also reduced the orbital inclination to less than 7 degrees, to drop the satellite off in a Geostationary Drift Orbit from where it can reach its operational slot. Separation of the satellite is expected after a mission duration of around six hours. 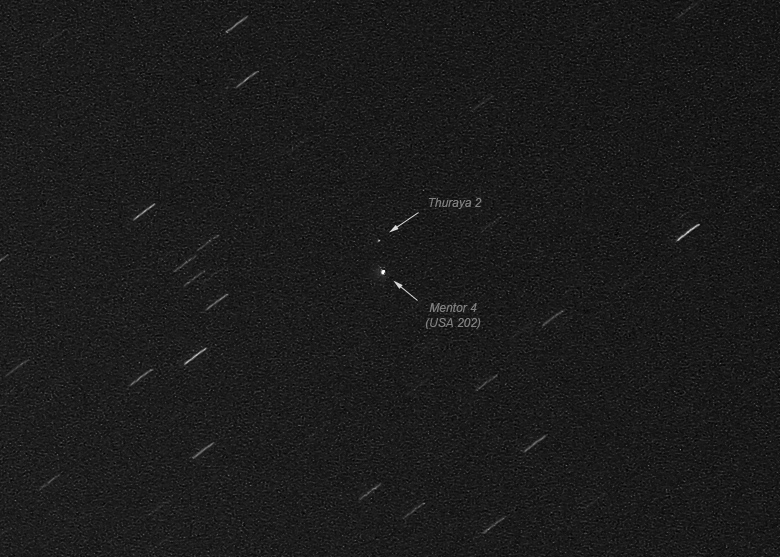 Once fully deployed, the classified Mentor satellite will be easily visible to observers on the ground, allowing its operational slot to be pin-pointed and also acting as a final confirmation of the payload’s identity. The next Delta IV Heavy won’t fly until 2018 when it will lift NASA’s Solar Probe Plus – a very unusual customer for Delta IV Heavy since the spacecraft only weighs a little over 610 Kilograms, but requires an extremely high injection energy to set up a close encounter with the sun.